Distribute your calendar with teammates in PDF format, or simply print them out. Are you looking to download or print your Production Calendar? If you're looking to download your Calendar to share with team members or clients, this is a simple process and it won't require anyone to login. Follow these quick steps to keep your teammates in the loop by printing or saving your gantt chart calendar as a PDF file. In the print pop-up, click Print. To save it as a PDF, change the Destination to Save as PDF and click Save. 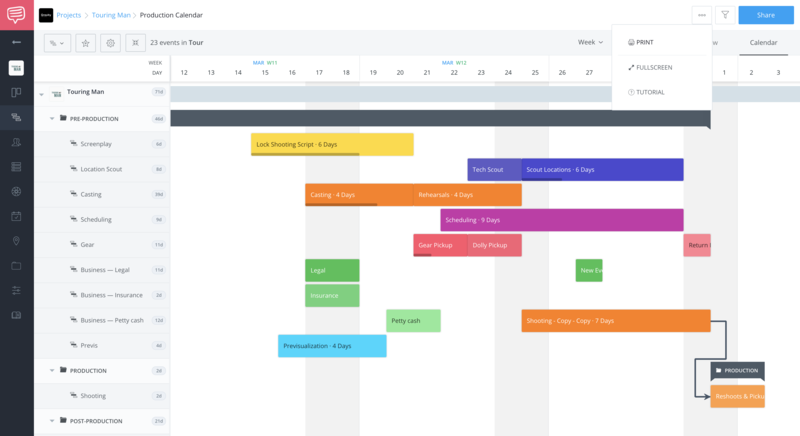 When you are ready to save or print your calendar, it's important to keep in mind that it will take a snapshot of what is on the screen at the moment. For example, if one of your Events are cut-off (because it's zoomed in too far), that is exactly what will be seen when you print or save your calendar. Landscape: To include as much of the calendar on one page when you print or save, we would suggest changing the Orientation to Landscape mode. This will allow you to have more Events on the page.